Come to think of it, in the four years that we have been away from Singapore, we have also missed out on four Chinese New Year celebrations. If there is one thing I really miss about the festival, it is not the lion dance, ang pows or new year greetings. It is the family reunion. Every evening before Chinese New Year, my family will sit together at the dinner table and have a steamboat session. It's not just with my beloved family - my parents, brother, sister-in-law and niece, but with the extended family including my 80-year-old grandmother, my aunt who stays in Kuala Lumpur, my uncles and my cousins. We will take turns to greet every elder around the table, we will pick out food for each other, we will take the chance to catch up on one another's life, we will talk about anything from babies and movies to politics and backpacking trips. In Sweden, it was a blessing that the husband's workplace was a stone's throw away from our house, therefore he could easily come home for lunch and then dinner every day. While that got stressful on my part to have to wake up, prepare lunch, wash up the dishes and then think of what to make for dinner, I didn't want to take the easy way out by packing leftovers for him and I appreciated the fact that we had the chance to eat together as a family so often. Reunion, to me, has a very special meaning and now that I have my own family, it is even more important that we take time out to have meals with one another. Last Sunday, we were honoured to be invited to be part of the The Real Reunion - a social initiative to strengthen family bonds through meals, led by four final year students from Nanyang Technological University, Wee Kim Wee School of Communication and Information. Yes, which essentially makes me their senior since I graduated from the same faculty and did my own integrated communications campaign some 8 years ago. The unique concept is born out of a realisation that youths today are having less meals with their parents and targets to reconnect families in order to develop healthy relationships. In fact, reunions should not be restricted to festive days only but can take place any time, any day. 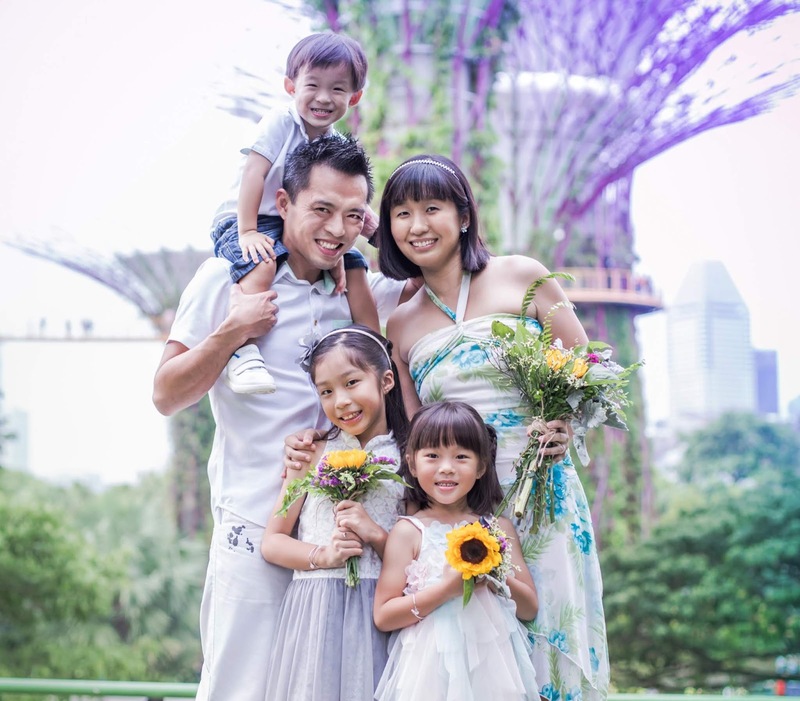 Did you know that 2014 is the international year of the family? When was the last time you sat down to have a hearty meal with your parents? What is special about your reunion dinner? How do you make effort to stay connected to the people you love? What does the word 'family' truly mean to you? While it might be overly idealistic and maybe even impractical to have big family gatherings every week, I do think this initiative is off to a good start and serves as a timely reminder for us to slowly but surely take time off from our purportedly busy schedules to spend time with the people who matter. Here are some of the pictures from the dinner, which was held at the picturesque Blisshouse Theme Restaurant in The Central at Clarke Quay. It is not about what you eat; it is about who you are eating with. For practicality, some parents let their kids eat at smaller tables while they themselves eat at the dinner table. We used to do that too, until one day Angel came up and said "Mummy, I am lonely sitting there. Can I come and sit with you all?" And so, from that day, we try best to eat together at the same table. All she needs is a cushion or booster seat and as for the baby, she is on a baby chair but right between us. If you can't turn them off, at least put them a distance away. This includes phones, tablets, television and any other thing that can beep, ring or interrupt the meal in any way. The last thing you want your kids to learn is to be distracted when it comes to meals. 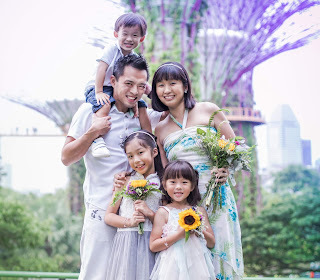 It's ironic how when living in Sweden, we never saw the Swedes using electronic devices to occupy their kids but most Singaporean kids would have a phone or iPad in hand just in order to finish a meal. So, the husband and I decided we will never let our kids do that and to achieve that, we must first be role models and rid the distractions during mealtimes. Strike conversation about your daily life, for instance ask the spouse on his/her day at work or ask the child what he/she learnt in school. When someone is talking, use your heart, not just your ears, to listen attentively, make acknowledging statements or ask relevant questions to carry on the conversation. Instill a habit of making eye contact with the person you are talking to. Don't solely concentrate on your bowl of food, don't look around the surroundings, instead make it a point to look at the speaker in his/her eyes to show that you are sincere, engaged and interested. Take turns to let everyone have a fair share in talking. Even if the person is talking about a topic you are not interested in, don't let your mind drift away. For instance, I am not familiar with military tactics nor is the husband keen on blogging and html. But, we do put in effort to understand what each other is saying and give our support, advice or even criticism when needed. Learn to be part of each other's lives, that is why we are called a family, right? On weekends or whenever possible, let everyone play a part in the cooking or meal preparation. That, is a great way to make the meal worth anticipating and another fun way to bond. For now, Angel helps to wash the rice and peel vegetables. As for the husband, he is an awesome chef in the kitchen and even if he is not in time to help to cook, he will usually help to do the dishes. Remember, a happy reunion dinner is not about having shark fins and abalone; it is about having your loved ones beside you and knowing that you are blessed to have a family. Will you take an extra day or two this week, or every week, to have a simple meal with yours? 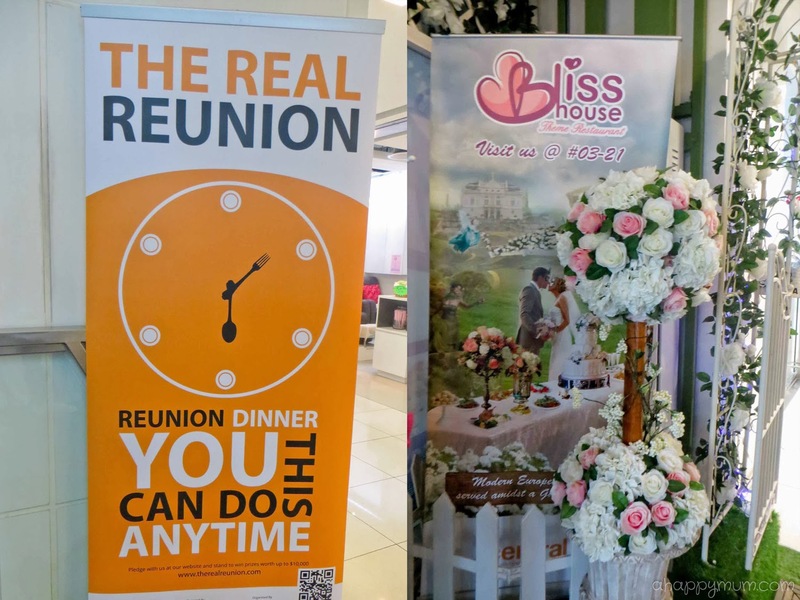 Disclosure: We were invited to join in The Real Reunion dinner at Blisshouse Theme Restaurant. All opinion and text are my own. i recognise your girls on TV! Great tips. We got to sit around the dining table to eat as a family more. That's why I prefer to eat at home then we'll have more time to sit around and chit chat rather than get chased by unfriendly waitress.